Still just about in the Southwest, Dinosaur Valley contains many fossilised dinosaur footprints, preserved in flat limestone rock layers exposed by the Paluxy River - a scenic tributary of the Brazos, one of the largest rivers in central Texas. The valley is contained within a state park, 40 miles from the suburbs of Fort Worth and close to the little town of Glen Rose, on Farm Road 205. The park includes 4 miles of the river, which here flows around a large 180° meander, while other tracks are located on private land upstream. Apart from looking at prints, the park is good for camping, hiking, mountain biking, swimming and observing nature. Visitors to Dinosaur Valley State Park are greeted by two large plastic dinosaurs near the entrance, beyond which is a loop road with several short paths leading to viewpoints along the river, and also a campground with 46 shady, well-separated sites. The number of dinosaur tracks visible depends on the river level, which can vary by 10 feet during the year, and the flow may dry up almost completely during a hot summer. Footprints are best viewed when covered by a small depth of water - they tend to be less distinct when dry, and those permanently above the river level are liable to erode and disappear quite quickly. 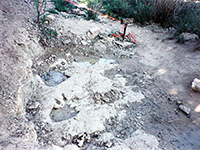 Tracks of two species are commonly found - distinctive three-toed prints, up to 2 feet long left by a carnosaur (carnivorous animal) of the same family as tyrannosaurus rex, and even larger saucer-shaped impressions from a sauropod - the general name for huge, slow-moving, plant-eating dinosaurs. There are also occasional tracks from a third creature - similar to those of the carnosaur but wider, with less distinct toe impressions. All date from the Cretaceous era, about 100 million years ago. 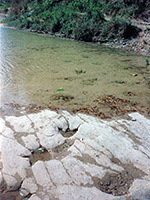 Fossilised footprints are found in 3 main locations along the river. First is The Blue Hole - a large pool, up to 20 feet deep and popular for swimming - with many 3-toed prints on rock ledges just above or below the water. The main location is 300 yards further - both of the common types of tracks occur quite extensively. Several trenches in this area indicate where large slabs with particularly fine fossils were excavated and donated to museums. The third location is 1 mile downstream, close to the campsite - various well-defined trails of up to 20 steps cross the river bed, at this point quite flat and usually with shallow water. 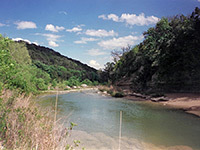 Most visitors to Dinosaur Valley just look at tracks since little walking is needed, but there are several miles of pleasant trails, winding through the wooded country at the far side of the river - a limestone plateau covered by mixed vegetation, similar to the Hill Country further south, with small creeks and side canyons. One good route (the Blue and Yellow trails) crosses the river via a row of stepping stones near the third main track site, climbs up to the plateau above the river and follows it around the bend to the second site. There is plenty of wildlife - fish, turtles and snakes live in the river while various lizards, rodents and mammals inhabit the forest including deer, which are apt to wander through the campsite around dusk. The nearest places with hotels close to Dinosaur Valley State Park are Glen Rose (3 miles), Granbury (25 miles) and Stephenville (30 miles).